Dissolvables are foods move in and out of a baby’s diet quickly. They are “teaching” foods that really don’t add a lot of nutritional value but provide an opportunity for the tongue, lips, jaw and cheek to learn how to work together. Moving and manipulating pieces of food safely is a tricky job! These foods melt/dissolve when mixed with saliva and break down with little to no pressure from the jaw. as a thickener for purees. They are particularly helpful to gradually transition to a lumpy puree. The beauty of grating or finger crushing one of the foods above into a powder and adding it to a familiar puree is that it will slowly dissolve in your baby’s mouth. If they are uncomfortable with the texture, it will slowly become something that they are more familiar with. to transition from thickened purees/lumpy purees to small pieces of soft solids. Rather than offering a whole rice puff or baby mum mum, break it into a very small piece and offer it to your baby. Next time, try a slightly bigger piece and see how it goes! to develop bite and chew skills when your baby is successfully managing cubes of soft solids. Biting off a piece from a bigger chunk of food with your front teeth and moving it to the molar area for chewing is a difficult skill. It is reassuring to a parent to try it with a stick of something that you know will dissolve into mush with little pressure. Veggie sticks are a perfect tool for this. Our kids getting hurt, in any way really, is a fear. Obviously. Choking falls in this incredibly scary zone. This fear is so intense that parents I work with often confuse choking and gagging. I was once doing a session with a dad who started sweating every time his son mildly gagged. It finally dawned on me that he thought his son was choking and near death. Explaining gagging to that dad forever decreased his stress level at mealtime . At the same time, the session highlighted the importance of infant/child first aid training . He was incredibly scared because he didn’t know what to do. The confidence that infant and child first aid training gives you is immeasurable during the “learning to eat table foods” phase. I don’t know too many families that have this knowledge unless it is already part of their professional training. It is empowering to know what to do for your baby (other than calling 911) if he or she is unable to manage a piece of food and it leads to choking. My second baby has always had some difficulty managing thin liquids and I assume she has taken liquids into her lungs more than the average baby. Luckily she’s been able to handle it and stayed healthy. We’ve been able to make adjustments to keep her safer, and her coordination has improved. She has had a couple of episodes where she’s had trouble with a food. One particular incident led to uncontrollable coughing, a red face and bugged out eyes. My heart started racing, I hauled her out of her highchair and put her in the position to start back blows and thankfully, she started vomiting profusely. It was one of the scariest moments of my mama career (with the exception of the H&M incidence where E decided to hide quietly in the clothes racks for about 10 minutes). I AM SO GRATEFUL THAT I HAD SOMETHING I KNEW TO DO IN THE MOMENT. Something to think about when you are booking your prenatal classes. We’ve chatted about when to introduce foods, how to introduce it, and what your first food options are. Your baby is eating many smooth purees by now. Parents can be so relieved that their baby accepts a variety of tastes that they forget about introducing different textures. All of the sudden there is a panic to move onto lumpy and table foods. The baby is abruptly presented with a full meal of a brand new texture. Gone is the smooth applesauce that he loved and in its place is some unknown lumpy mound of cooked apples, seemingly a totally different food. Back to the scary zone for a lot of babies. A 10/11 month old that only accepts fine purees and discerns the smallest piece of grit is very challenging. We want to prevent this from happening. The goal: think about moving away from smooth purees as soon as you have a variety of accepted tastes. It’s a progression that is easiest when you move at the speed your baby sets. Some babies are much more sensitive to texture changes and need small changes with added time to adjust. Other babies can go from smooth puree to lumpy to table foods in quick succession. I’d like for you to have tools to prevent challenges in the first place, or at least from minimize how big the challenges become. Please keep in mind that these strategies are not meant to be “therapy” for your child if he has been identified to have feeding challenges. Make sure you see your physician or feeding therapist for assessment and individualized recommendations if you are concerned. Always, always be working on increasing texture. Don’t expect your baby to instantaneously accept the majority of a meal in a new consistency (although I hear that these wonder babies do exist!). Babies don’t have the luxury of knowing what food is coming at them based on visual recognition. They don’t have enough experience for that. The same applesauce of a different consistency seems like a brand new food. As adults, the sight of applesauce allows us to predict the taste, even when it is a different consistency. To your baby, it is just like being fed blindfolded. Everything is a surprise. At most meals you want to be offering at least one bite that is a new/more challenging consistency. You’ll need to adjust your jumps in consistency based on your baby’s reactions. You don’t need to do every step listed below. Pick and choose what works for you. First, you want to increase the thickness of a familiar food. You can even present a few thickness options of the same food, at the same meal. Start by offering the familiar thin consistency, then offer a bite of the slightly thicker version. Head back to the familiar thinner puree if the thicker one was more difficult for your child. If not, offer a bite that is just a little thicker. This seems like a lot of work but really you are only preparing a few tastes of the thicker consistency. I’ll post some photos of how I do it soon. You can increase the thickness of a food by adding baby cereal, wheat germ, tofu, greek yogurt, or ground oats. Please let me know if you have a food that you’ve used to thicken. I love discovering new things. Once thicker purees are going well, try adding some lumps that will dissolve in your baby’s mouth. Things like crushed up Mum Mums, crushed up rice puffs, crushed Farley’s biscuits will all dissolve in about 5 seconds in your baby’s mouth. This provides an opportunity to feel a “lumpier” texture that changes to a more familiar consistency quickly. Next move to soft lumps. Think very mashed banana, mashed avocado, mashed very ripe pear, or anything else very soft and mash-able. This can also be presented gradually. When you are mashing the banana, take a spoonful out when you’ve just begun mashing, then continue mashing the majority of the volume until it is just a little lumpy. Offer both consistencies at the same meal. Finally, move to small, soft cubes/pieces (small cubes of ripe banana, pear). You can introduce these just after the lumpy version or in tandem. Move back and forth between a small piece of banana and the lumpy version within the same meal (if tolerated). If a small piece of banana is spit out right away, try squishing the cube to soften it up a little bit. I’ll post some food ideas within each categories soon… plus another tool to help develop tongue skills while you are working through the progression. There are a few things to consider when buying spoons for the journey to table foods. Spoon characteristics are easily overlooked. Size! Some spoons are very wide and flat. Take a look and make sure it will be small enough to fit comfortably in your baby’s mouth. Shape! Babies need to learn to bring their lips down to meet the spoon and clean the food off. If the dip in the bowl of the spoon is deep, they will be unsuccessful at removing the food on their own. Parents tend to “baby bird feed” with a wide spoon, or when a baby doesn’t use their lips to remove the food. “Baby bird feeding” in when the spoon is tipped up and the food is either dumped in the mouth or scraped off the upper gums. I shiver every time I see this. It doesn’t give babies a chance to learn to use their lips! Start off with a flatter, narrow spoon. As your baby gains skill, move to a spoon with a deeper dip. Material! 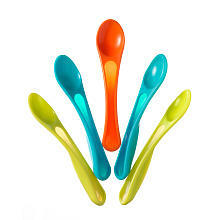 Spoons can be soft silicone, hard plastic, wood, or metal. Babies may have their own preference. I tend to prefer the softer, coated spoons for the early days. These are have a nice flatter well and are narrow enough to fit in a baby’s mouth. They are also really nice for developing self-feeding spoon skills. The baby doesn’t need to scoop to get the food on. He can dip it into a sticky food (greek yogurt, oatmeal, etc) and bring it to his mouth. Tomee Tippe Spoon: These have a slightly deeper well compared to Playtex but still have one of the narrower styles on the market. Mealtime Notions Duo Spoon is a soft, flexible, bumpy and ridged spoon that is fantastic for oral exploration and dipping. Not meant to facilitate development of self feeding feeding skills but it is a great dipper! 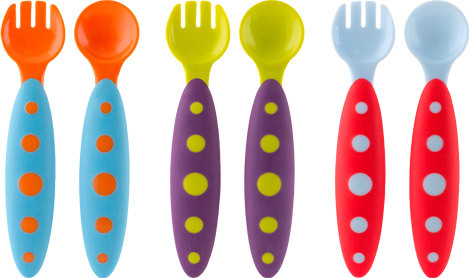 Munchkin Soft Tip Infant Spoons and First Years Disposable Infant Spoons are also on the narrower side. Be wary of Nuby. They tend to be too wide. 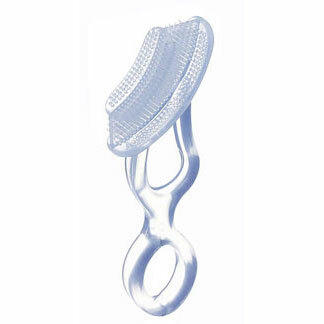 Boon squeezable spoon apparatus. I get the no mess perspective as a mom but the therapist in me thinks that the kids lose out on not getting messy. 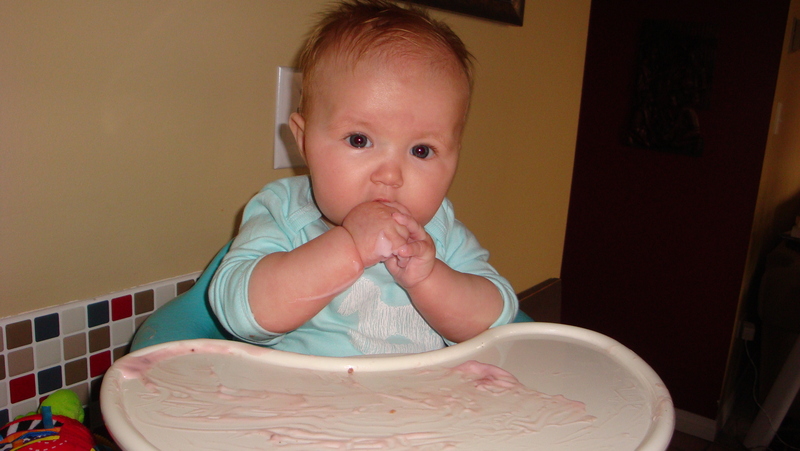 Getting messy is a way of learning about the food and becoming comfortable with it before it gets to their mouth! The Boon Mod Ware utensil set. I am not a fan of these as a first spoon. I find the well too wide to fit in baby’s mouth nicely. This doesn’t facilitate the development of lip closure on the spoon. many kisses from loved ones! What better positive way to provide safe sensory input to little cheeks and mouths! We’ve talked about readiness signs and the reasoning behind starting to offer calories from “food” at approximately 6 months of age/development. North American parents have traditionally introduced rice cereal as a first food. There seems to be a movement away from this practice in the general mama community, especially white rice cereal. It is a prominent belief for followers of the baby-led weaning method. Baby-led weaning is a method of foods introduction wherein the baby is offered whole foods. The baby has complete control with this method. For example, you steaming a whole artichoke, place it on the baby’s tray and allow him to decide what to do with it. Purees and spoon-feeding is discouraged. I will elaborate on the benefits and definite risks of this approach in another post. US Pediatrician, Dr. Green has also spearheaded a “Whiteout” campaign. Infant cereal, pureed meats and fish are recommended as first foods by the American Academy of Pediatrics, Canadian Paediatric Society (CPS), Dieticians of Canada, Breastfeeding Commitee for Canada, Public Health Agency of Canada, and Health Canada. CPS also identifies poultry, cooked egg yolk and well-cooked legumes (beans, lentils, chick peas) to be good sources of iron and suitable for first foods. Choice of first food is influenced by a host of factors, including tradition and culture. Regardless of the actual food choice, it is critically important that it is iron rich. Iron stores are low in exclusively breast fed babies by 6 months, thus introduction of iron-rich foods is critical to prevent iron deficiency. You will make small incremental changes from familiar to unfamiliar, until you get to know your baby’s preferences. Some babies have an early love for eating and enjoy bigger changes. Other baby’s are skeptical and learly of food and you will be more successful with gradual changes. The first time you offer a new food, you may mix a small amount of the new flavor in a larger amount of breast milk. Additionally, recommendations for a slow food introduction (one food at a time, waiting 2 – 3 days between new foods) are to ensure identification of allergies and reactions. As a result, it could take weeks to get a few foods on board. So… bottom line. You don’t need to start with rice cereal if you feel strongly against it. Options include: rice cereal (white, whole grain), or meats/alternatives (eg. lentils, red kidney beans, cooked egg yolk). Meats are tricky to puree to a runny, smooth state and are easily grainy, not great for a first experience. Cooked egg yolk pureed with breast milk/formula is a great way to achieve a smooth consistency. Big picture: Once first foods have been accepted, introduce other pureed fruits and vegetables. Aim for something high in Vitamin C once a day to ehance iron absorption (eg. kiwi, orange, broccoli, strawberries). Of note, delaying wheat cereal introduction until after 6 months has not been shown (to date) to protect against the development of a wheat allergy. 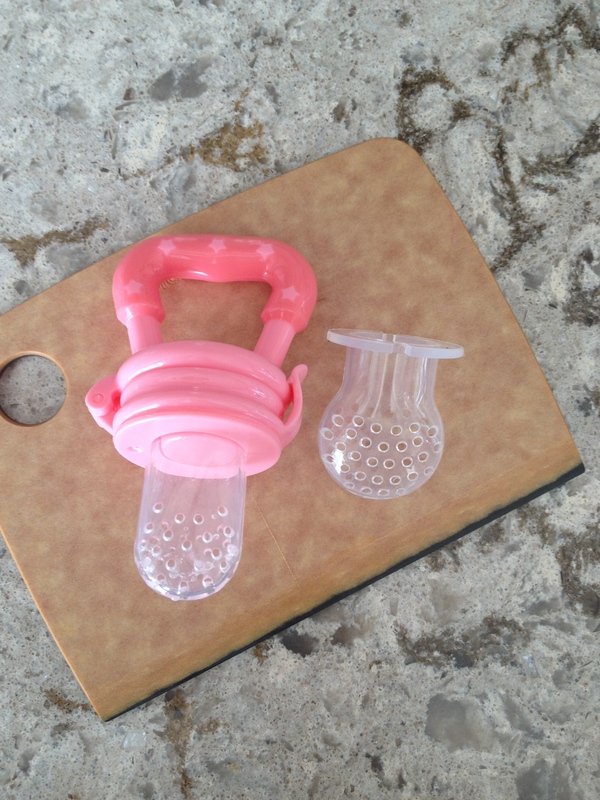 *When starting out, you want to offer solids after a breast feed/bottle. This is still the primary source of energy when you are starting out. 1. Set the scene: Prepare food and equipment before you put baby in the high chair. Make sure your baby fits in his high chair. Some high chairs are huge! Your baby may need some help feeling snug and secure. If he isn’t quite sitting independently, provide support by rolling up tea towels and placing them beside his trunk and/or legs. The new experience will be challenging enough. Your baby doesn’t need to waste additional energy trying to keep himself from toppling over. Add the tray and place a spoon or other implement (even a teething toy) for him to bang around. You can just see a rolled up tea towel peeking out at her side. 2. Mix your first food of choice with breast milk or formula. Use the familiar taste to bridge the change. The consistency should be very runny and a just noticeable difference from breast milk (think running off a tipped spoon). Start by putting some of the mixture on baby’s hands and tray before offering the spoon to his mouth. Let him feel it and smell it before it gets to his mouth. Don’t worry about volume. These are first experiences… it’s even a success if he looks at the food! I KNOW it’s messy to put food right on the tray and let your baby muck about. It is a small price to pay to build a solid, trusting foundation for food interaction. Remember what it felt like to have your feeder place an unknown food in your mouth? Now comes the mealtime dance. You and your baby are constantly communicating during this experience and he needs to learn that you will listen and respect what he is saying. Don’t push a spoon into a closed mouth. Allow him time to explore with his hands, he will likely lick the new food off of his hand. Dip your finger in the new food and touch it to his lips. With the next dip, offer it to his lips and maybe he will open his mouth. Take this as your cue to place your finger in his mouth! Your job is to follow his lead. If you chose to introduce cereal first, breast milk will break it down. The consistency will become runnier the longer it sits in the bowl. This change can be reassuring for baby as it slowly changes to a consistency he is familiar with. The next day, offer the same thing with a slight change. Add a little less breastmilk so that it is just a tiny bit thicker (i.e. doesn’t pour off the spoon like a thin liquid but has a few drops to it). Again, do not worry about the volume your baby actually takes in, these first experiences are about learning. Some babies prefer slightly thicker consistencies while others prefer thinner consistencies. Your job is to tweak things and really discover what your baby loves. You do not get a “bigger bang for your buck” if you load the spoon full of a new food. 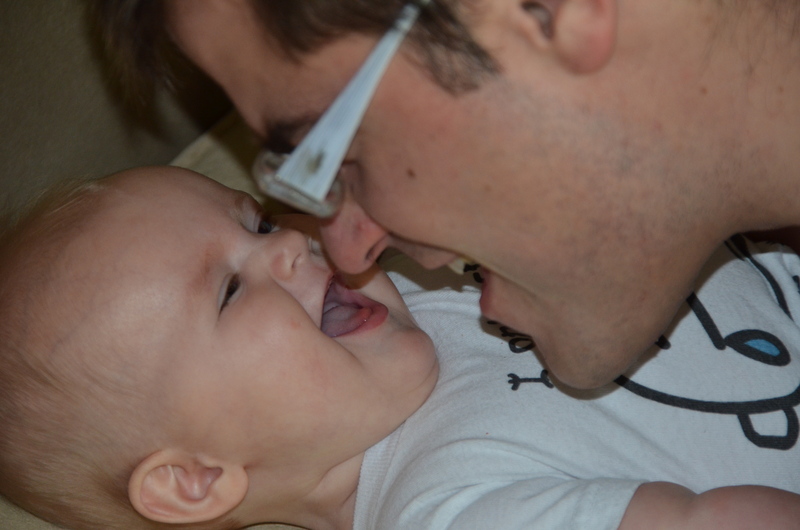 Start with a small amount on the spoon while your baby learns how to use his lips, jaw, tongue and cheeks. He now needs to transfer the food from the front to the back of his mouth. Heck, I’d be more likely to turn my head in protest to an approaching mountain of food too! 3. When you and baby are ready, move onto your next food! Free Class Alberta Health Services Childbirth and Parenting Education. Feeding your baby (up to 12 months). As of Fall 2013, I will be offering feeding therapy services for Calgary and its surrounding area. New this year are in-home consultations to help set you up for success on the journey to table foods. Details to follow. “Starting solids” is a ridiculous expression for teaching a baby to transition from breast milk/formula to table foods. The whole concept is misleading. It makes you think of sitting a baby in a highchair and putting a spoon in his mouth. In reality, babies can and should have many opportunities to learn about the whole process of eating long before their butts hit the highchair. Please don’t misinterpret this to mean you should be spoon feeding your baby before they are safe to do so. The term “starting solids” makes parents think that they have to wait until 6 months of age to venture into the process of eating.… NOT TRUE. Let’s redefine starting solids. I haven’t yet developed a more accurate and concise expression. I have been toying with: transition to everyday foods, breast to table…. however, none of them are ideal. I’ll keep working on it. This transition is significant. Most healthy babies obtain approximately half of their energy needs from table foods by the end of their first year. Breast milk or formula, initially the exclusive sources of a baby’s energy, gets downsized to 50% . This change really occurs over the short course of 6 months. In addition to the dramatic change in energy source, the table food transition also imposes abarrage of new textures: runny liquid, dissolvable food, lumpy puree, and soft food! 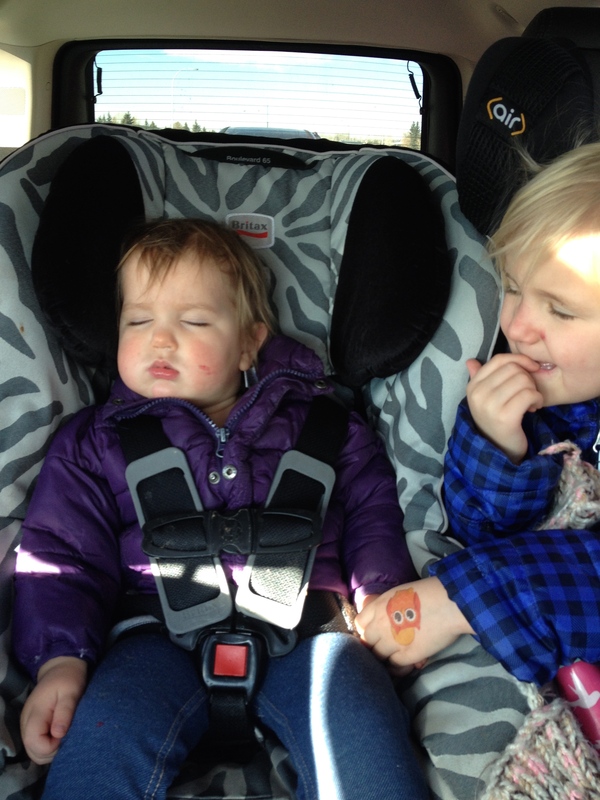 So many new sensory challenges…..talk about a lot of work! Previous recommendations have suggested that solids be introduced between 4 and 6 months of age. 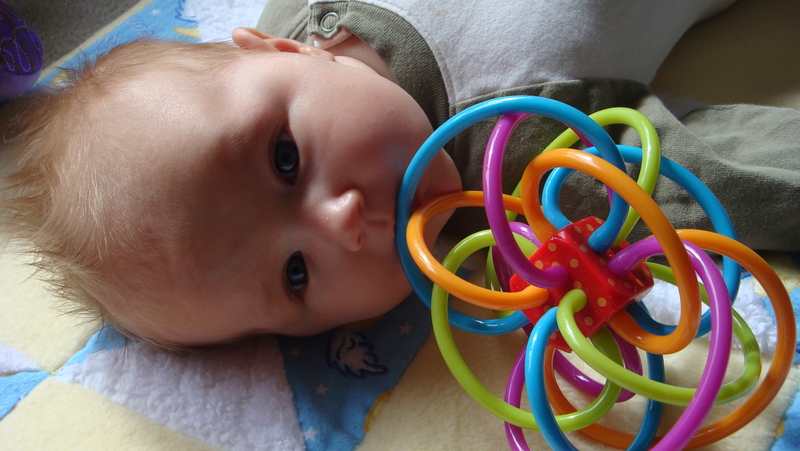 Newer recommendations suggest introducing solids at 6 months of age . World Health Organization (WHO) and Canadian Pediatric Society recommend exclusive breastfeeding for the first 6 months of life. 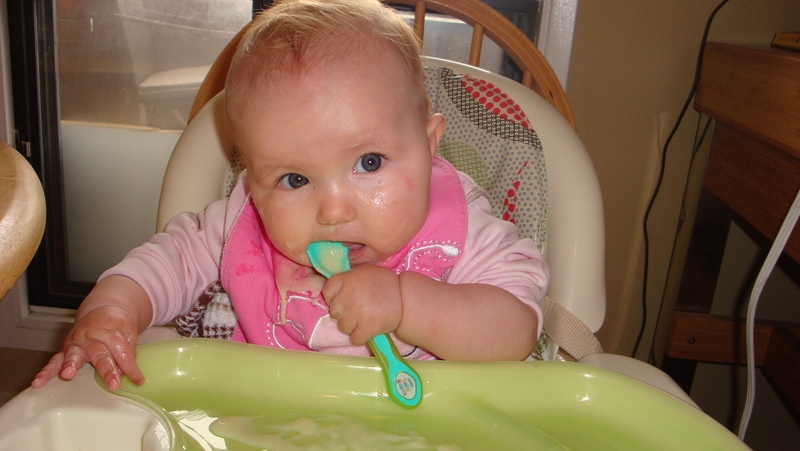 Most babies are developmentally ready for solids around 6 months of age. In addition,the 6 month mark is the point at which a breast-milk exclusive diet is inadequate to support a baby’s nutritional demands; the volume of breast-milk required to meet his needs for energy, protein, iron, zinc and other vitamins is untenable . Also, later solid introduction (i.e. much later than 6 months) may put babe at risk for developing oral aversion (not wanting anything in the mouth). So how we do set the stage for success? We all dislike abrupt change. Opportunities to learn about different shapes, textures, and temperatures will help your baby feel more comfortable with something other than breast-milk or formula in her mouth. This needs to happen before she is put into a high chair! What if the interest is there but you are not sure if motor skills are? What if the motor skills are there but the interest isn’t? There is no reason you can’t teach your baby about the eating process before all of the readiness indicators are present. If she is awake and you like babywearing, put her in a carrier as you prepare dinner so she can be exposed to the smells. This might be a necessity anyways for those cranky babies during “witching hour”. Someone is always needy when it’s time to make dinner at my house. Always. Since my kids were tiny, dinner hour has been witching hour. If it’s not the cranky one holding her little arms up, the older one is demanding to sit on the counter and help! Unless you just plain need a break from baby or you have your hands full with older kids, hold baby in your lap as you eat dinner. Give her intermittent kisses as you eat. She will smell the food on your breath and maybe even get a taste if you give her a smacker00 right on the lips. I recently attended a feeding conference and the presenter suggested the idea of “kiss therapy” for kids who are ultra-sensitive. I like the idea for all kids before they end up in a high chair for meals. Once she has the ability to grasp an object and bring it to her mouth, be creative with the object you offer her to play with and mouth. Obviously make sure they are safe, but you don’t need to stick with baby toys. Her hands and toes are wonderful things to shove in her cheek, lick and drool all over. It teaches her about her tongue, jaw, lips and cheeks. Your fingers are great too! Think beyond hard plastic toys… she can hold one of your raw carrot sticks as she sits on your lap during dinner. It’s safe if is is thick enough that she cannot bite through it. Or a piece of beef jerky. A lick of your apple as you eat it (you would control handling the actual apple). 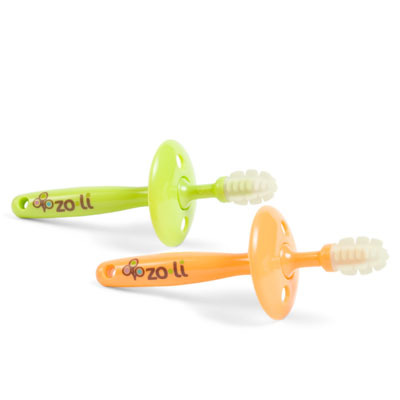 Baby toothbrushes are usually textured and some even come with a guard that prevents baby from gagging herself over and over. Try freezing teethers or links. These ideas are not meant to replace therapy recommendations for babies who are identified as at-risk feeders. Default to your physician or therapist if your baby has medical differences and has been deemed to be an unsafe swallower. 1. Complementary feeding: a commentary by the ESPGHAN Committee on Nutrition. AUAgostoni C, Decsi T, Fewtrell M, Goulet O, Kolacek S, Koletzko B, Michaelsen KF, Moreno L, Puntis J, Rigo J, Shamir R, Szajewska H, Turck D, van Goudoever J, ESPGHAN Committee on Nutrition: J Pediatr Gastroenterol Nutr. 2008;46(1):99. 2. Food and Agriculture Organization of the United Nations (FAO), World Health Organization (WHO) and United Nations University (UNU): Human Energy Requirements. Chapter 2: Energy requirements of infants from birth to 12 months. Available at: http://www.fao.org/docrep/007/y5686e/y5686e05.htm (Accessed on January 21, 2013). 3. Committee on Nutrition American Academy of Pediatrics. Complementary feeding. In: Pediatric Nutrition Handbook, 6th ed, Kleinman RE (Ed), American Academy of Pediatrics, Elk Grove Village, IL 2009. p.113. 4. Eiger MS. Feeding of infants and children. In: Primary Pediatric Care, 4th ed, Mosby, St. Louis 2001. p.184. 6.Agostoni C, Decsi T, Fewtrell M, et al. Complementary feeding: a commentary by the ESPGHAN Committee on Nutrition. J Pediatr Gastroenterol Nutr 2008; 46:99.